allstaractivist note: All four of these acts are one in the same in that they serve the same goals, to strip us of both our Constitutional and human rights. What I’m about to explain is my understanding of what these four acts are, their purposes and effects on society. I have not read these pieces of legislation but neither have the legislators who signed them. They were all “rubber stamped” and written by bureaucrats and “special interest groups” who have a vested interest in only one thing, enslaving you and I. Even though the vast majority of us have never participated in the writing of any law, we have to live under every single one of them. That is neither democratic nor fair and is nothing less than defacto tyranny. Was I ever asked if these acts were something that I wanted? No. Were you? No. Do we have any direct way of expressing either our support or opposition to or for them? No. Sure, they will tell you that you have a choice when you cast your vote for your state representative but come on, do those guys ever do what we want them to? No. That’s why I’m telling everyone not to vote at all in the upcoming 2016 elections next year, you would just be legitimizing an illegitimate sham meant to make you think you actually have a voice when you don’t. Should enough people see through the “elections” scam, they then start calling for mandatory voting just as they did a few months ago. Can’t have such an obvious denouncement of the process hanging out there due to only thirty percent or less showing up to vote. Don’t vote at all in 2016 and you will actually be making yourself heard by the only means at your disposal, that is unless they force you to of course (at gunpoint?). Considering that the authors of The Patriot Act (Rep. Jim Sensenbrenner, R-Wis. and former Secretary of Homeland Security Michael Chertoff) have both publicly denounced it’s use as “excessive and un-American”, The Patriot Act should have been wholly repealed long ago. Passage of the USA Freedom Act is nothing more than the Patriot Act by another name and adds insult to injury. Is’nt it strange how fast they passed it? Even the ACLU thought it would have time to debate certain sections before being signed by Obama, “Though the Senate overwhelmingly voted to move the bill forward, there is still the opportunity to amend the bill before passage.” SURPRISE! Rammed through! The Patriot Act failed to prevent the Boston Marathon Bombing, the very type of terrorist act that it was intended to stop yet, Edward Snowden remains in exile. The only thing it has proven to be good for is allowing the Obama Administration to violate everyone’s privacy via the NSA. The NSA serves at the pleasure of the President bye the way, and could be shutdown by him with the stroke of a pen. He totally owns everything they do. Now, with the passage of the USA Freedom act, the NSA remains intact and only superficially restrained. The USA Freedom Act is nothing but The Patriot Act by a different name. Have we forgotten that the entire thing is an attack upon our Constitutional Rights? You’ve got the ACLU and other various “civil rights” organizations applauding the insignificant changes made by it, but I don’t want my government spying on me at all. Many people now believe that the 9/11 attacks were attacks that we perpetrated upon ourselves (by proxy) so that Homeland Security and the The Patriot Act could be rammed through. I now say this in all loving kindness to my fellow man and woman, if you don’t believe that the United States Government would attack it’s own citizen’s, you are an imbecile. The September 11th attacks were a “false flag” taken right from the pages of a 1962 proposed operation against Cuba called “Operation Northwoods“. Operation Northwoods consisted of a collection of memos written in 1962 by both the Department of Defense and The Joint Chief’s of Staff. They named the new document “Justification for U.S. Military Intervention in Cuba (TS)”. The memos called for the Central Intelligence Agency (CIA) or other US Government operatives to commit acts of terrorism against American civilians and military targets, blaming it on the Cuban government and using it to justify a war against Cuba.The finished proposal was subsequently presented to the then Secretary of Defense Robert McNamara and President John F. Kennedy. Kennedy rejected the proposal and those present who personally witnessed his reaction said that he called the presenters “crazy”, accentuated with a healthy dose of profanities. He was murdered the following year. After the 9/11 attacks, the criminals in government were able to establish The Department of Homeland Security and The United States Patriot Act without opposition from the people. A successful false flag using the Operation Northwoods template. These two actions were an authoritarian power grab and stripped us of many of our Civil Rights and liberties. They also accelerated the demise of the United States Constitution. I’m afraid we no longer have a Democracy and that America has been corrupted from within. Abandoning Christian values leads to decadence and decadence leads to corruptibility. It’s hard to say exactly what Jade Helm is since we have yet to see the results. What it has proven itself to be so far however, is nothing good. In short, it’s a military exercise encompassing ten states now (the list keeps growing) including California, as well as several large corporations as integral participants. The exercise is supposed to prepare the military to fight terrorists on American soil, but factual reports have proven it to be far, far more. An unclassified military document reveals the states involved in a controversial multi-agency training exercises that will place 1,200 military personnel into 7 Southwest states–with residents of Utah, Texas and part of Southern California designated as ‘hostile’. But with residents of the entire states of Texas and Utah dubbed ‘hostile’ for the purposes of the exercises, Jade Helm has some concerned the drills are too realistic. 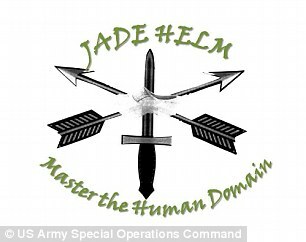 Special ops: Operation Jade Helm will involve Green Berets and SEALs and special forces from the Air Force and Marines starting in July and lasting 8 weeks. Military officials say they’ve gotten the go ahead for the operations from local authorities such as mayors and county commissions. And sheriff’s deputies told the Houston Chronicle they would ensure residents living near where aircraft were slated to create disturbances and drop soldiers, civilian and military vehicles will barrel through and where blank rounds would be fired. Jim Stewart with the Brazos County, Texas Sheriff’s Office told the Chronicle that such exercises are far from anything new. Texas, which the military has designated as ‘hostile’ for the purposes of the training, was chosen to be a hub of the unprecedentedly large program because ‘Texans are historically supportive of efforts to prepare our soldiers’ writes the USASOC. 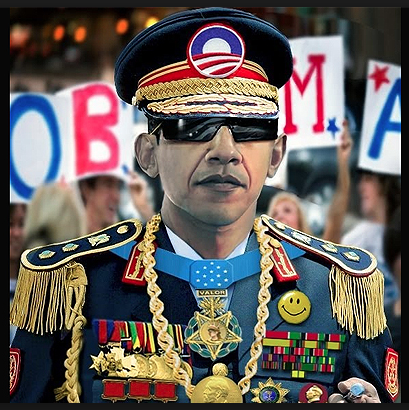 ‘The size and scope of Jade Helm sets this one apart. 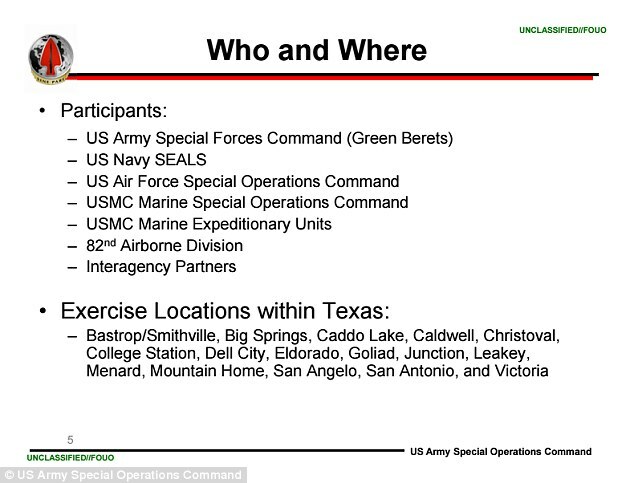 To stay ahead of the environmental challenges faced overseas, Jade Helm will take place across seven states,’ the USASOC wrote in a March 24 release. The military has also reacted to widespread fear of the operation by calling some ultra-conservative coverage of the ‘martial law’ drills alarmist and inaccurate. So, what is the NDAA (National Defense Authorization Act)? Quite simply, it is a legal way for the government to imprison Americans it doesn’t like forever, without giving them due process. It is supposed to be an annual budget for the United States Department of Defense (DOD) and has been around for 53 years (since 1962). It has morphed however, into a backdoor conduit for unconstitutional laws. What the 2011 version has done is to resurrect a sixty year old idea called The McCarran Internal Security Act or Subversive Activities Control Act of 1950. Once again the government is using “terrorism” and dissent to take people’s rights. The 2011 version has shifted terrorism fighting responsibilities from traditional law enforcement to the military, violating a 1878 federal law prohibiting the military from acting as domestic law enforcement (Posse Comitatus Act). They’ve been doing it through private DOD contractors like Booz Allen Hamilton all along anyway, but now they want it to make it legal. Remember, everything that Hitler did was legal and backed up by law. The paragraph below is what President Harry Truman thought of that whole unconstitutional mess at the time. The Congress of 1950 had already been bribed, blackmailed and bought off, Truman’s veto of the act was subsequently overturned. Incidentally, this was the very same congress (The 81st United States Congress) who gave us the CIA. 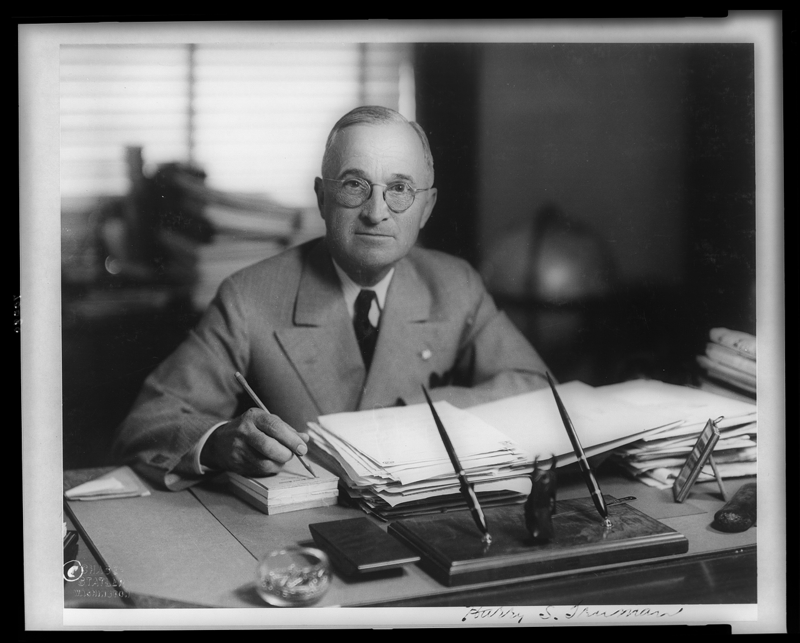 President Harry Truman vetoed The McCarran Internal Security Act on September 22, 1950, and sent Congress a lengthy veto message in which he criticized specific provisions as “the greatest danger to freedom of speech, press, and assembly since the Alien and Sedition Laws of 1798,” a “mockery of the Bill of Rights” and a “long step toward totalitarianism”. The House overrode the veto without debate by a vote of 286-48 the same day. The Senate overrode his veto the next day after “a twenty-two hour continuous battle” by a vote of 57-10. Thirty-one Republicans and 26 Democrats voted in favor, while five members of each party opposed it. Unfortunately, the below particular lawsuit failed to stop passage of the NDAA with it’s most egregious sections intact. It does however, sum up what the act really is fairly well. On December 31, 2011, President Obama signed into law the National Defense Authorization Act For Fiscal Year 2012 (NDAA). The National Defense Authorization Act is a bill passed into law each year. It allows the government to continue funding national security interests and the military for the next fiscal year. This year’s bill, however, was different: It contains a series of striking provisions which violate basic principles of American jurisprudence, and which we believe to be unconstitutional. 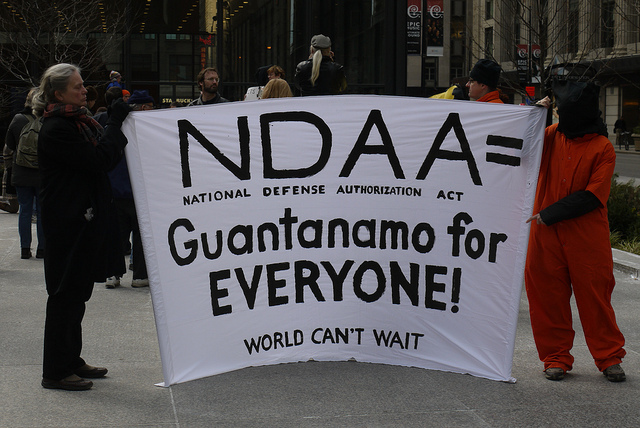 The 2012 NDAA greatly expands the power of the federal government to fight the so-called War on Terror. Many — including some of the law’s sponsors — assert that the NDAA seeks to authorize the US military, for the first time in more than 200 years, to carry out domestic policing. The language of this law is dangerously vague, but many — including several of its sponsors — believe that it grants what are essentially dictatorial powers to the federal government to arrest any American citizen (or anyone, anywhere) without warrant and to indefinitely detain them without any charge. Suspects can be shipped by the military to our offshore prisons and kept there until “the end of hostilities.” It is a catastrophic blow to civil liberties. Read Section 1021The law, however, does not define the terms “substantially supported,” “directly supported” or “associated forces.” As it stands, the law violates the 1st, 4th, 5th, 6th and 8th Amendments of the US Constitution and most of the Bill of Rights. The USA Freedom Act Passes! Senate Approves Restrictions on Surveillance Against Americans. Modest, but actual, scaling back on metadata collection authorities. We will see privacy-minded reform of the National Security Act (NSA) and FBI’s expansive surveillance authorities targeting Americans. The USA Freedom Act has passed the Senate. This is the first time Congress has restrained surveillance powers in years. The proposed amendments Senate Majority Leader Mitch McConnell (R-Ky.) introduced earlier today to weaken the USA Freedom Act were all rejected this afternoon by the full Senate. After his failure, the Senate voted in favor of the Freedom Act as it was additionally delivered to the Senate (meaning amendments by Sen. Rand Paul (R-Ky.) and Sen. Ron Wyden (D-Ore.) would not be considered). Ultimately the USA Freedom Act, which is meant to replace sunsetted Section 215 of the PATRIOT Act with stricter rules for the collection of Americans’ telephone and electronic metadata by the National Security Agency (NSA), was approved unamended. The final vote was 67-32. 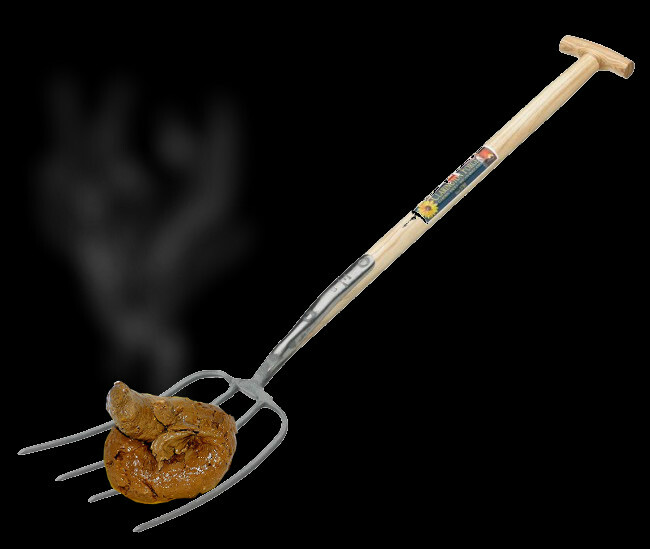 It will now head to President Barack Obama for his signature. The White House has already declared support for this version of the bill. The bill was far from perfect, which is why some privacy-minded politicians like Sen. Rand Paul (R-Ky.), Rep. Justin Amash (R-Mich.) and Rep. Thomas Massie (R-Ky.) opposed it and wanted it to be even stronger. Paul again said no for this final vote for the bill. But the passage of the Freedom Act should nevertheless be seen as a win. No, it does not end mass metadata collection entirely, but it does require more selective search terms for records, collecting them from the telecom and Internet companies using these terms, not just trying to collect all records and then searching through them for the ones they want. It also sheds some much-needed sunlight on the mysterious Foreign Intelligence Surveillance (FISA) Court by permitting third-party advisors to advocate for the protection of civil liberties and calls for the declassification of FISA Court decisions. (Read more about the Freedom Act here). There is still more to be done to scale back the authority of the federal government to inappropriately access Americans’ data. The Guardian has a look at what is next on the agendas of privacy politicians here. If you choose to celebrate this outcome, make sure to spare a toast to Edward Snowden, without which this would not have happened. ← USA Freedom Act vs expired Patriot Act provisions: How do the spy laws differ?